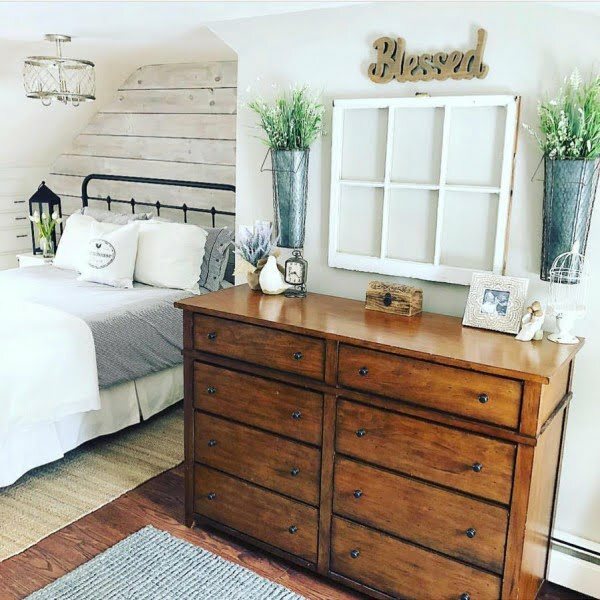 Looking to revamp your bedroom in the farmhouse style? 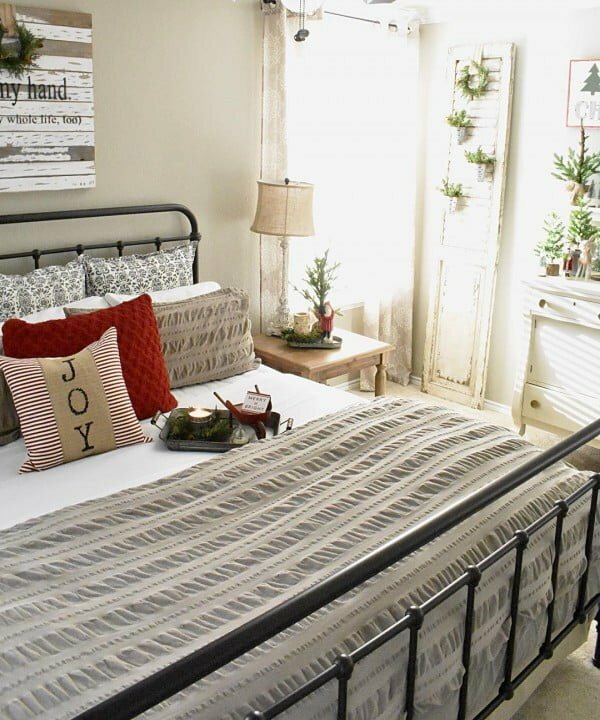 Here are 20 charming and cozy farmhouse bedroom ideas for your inspiration. Bedrooms should be an oasis from the hustle and bustle of daily life. They are where people relax, wind down, and recharge. 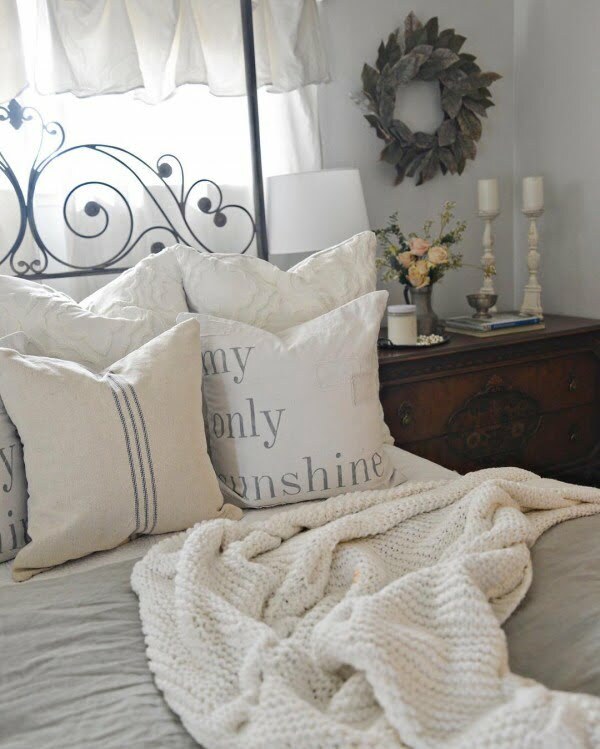 Not only should they be comfortable and cozy, but also pleasing to the eye to encourage lingering with that book or cup of tea just a little longer. 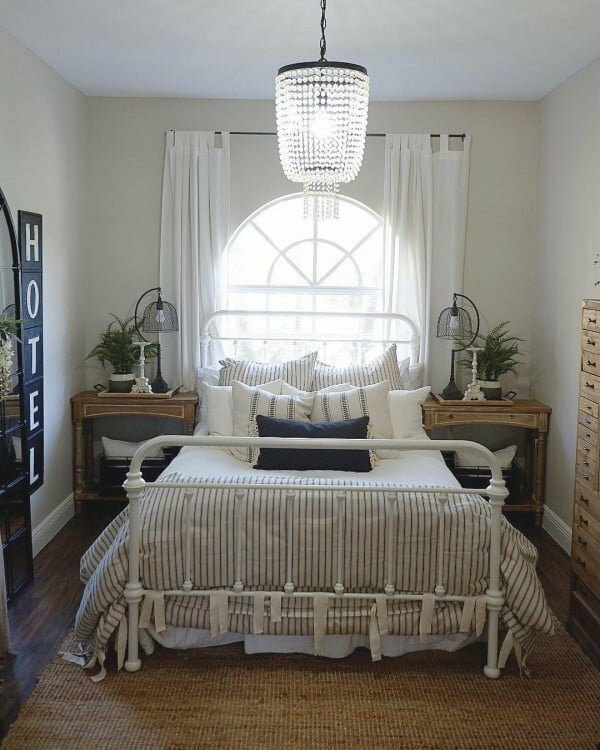 When it comes to farmhouse bedroom decor ideas, it is all about comfort, style, character, and homespun appeal. Bedrooms are quite easy to decorate as the wall behind the bed most often forms the feature wall, and what you choose to hang above the bed and how you stage the bedside tables, communicates the style and feel of the space effortlessly. 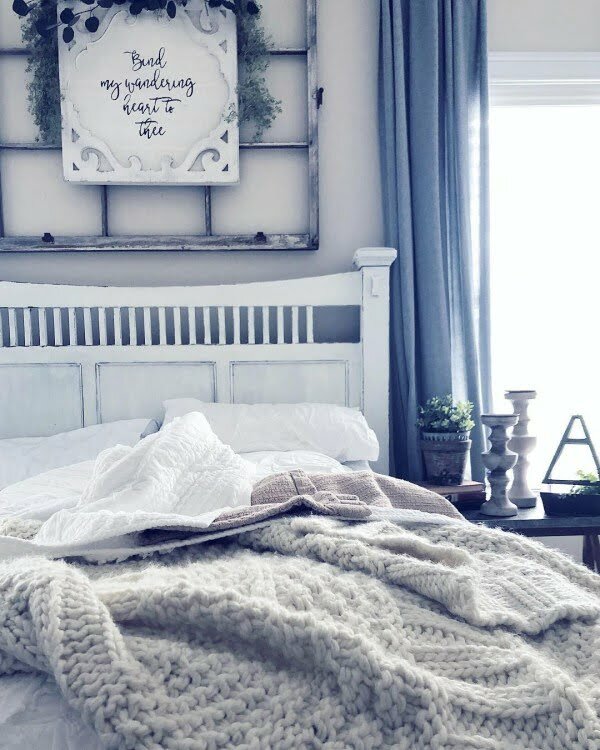 From wreaths to weathered furniture pieces, to textiles and unique artwork, these 20 farmhouse bedroom decor ideas can help you design the perfect bedroom space. When it comes to the farmhouse, it’s all about using items in a unique repurposing way. An old window frame becomes art above the night table, rather than a traditional framed image. Wallpaper in a room warms the space and wraps it around inhabitants. 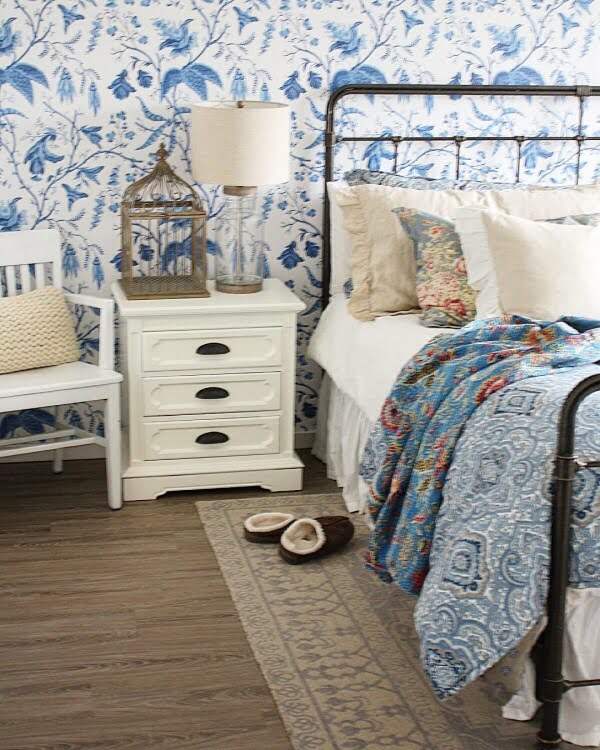 A floral or leafy print adds so much visual interest to a bedroom space. 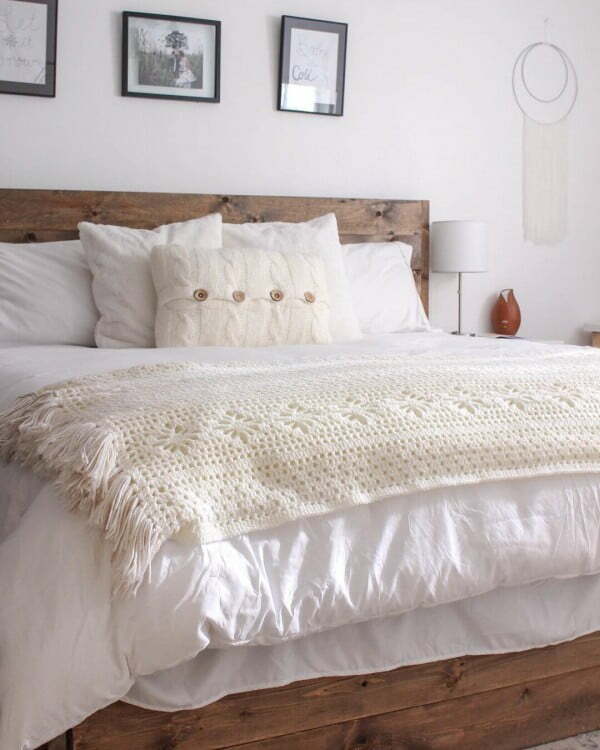 The comfort and the cozy vibe is easily cultivated with the layering effect of throws and pillows on a bed. They also soften and warm a bedroom space like few other items will. Wreaths are the ultimate in that country welcoming feel. Using them above a nightstands helps frame out the bed while creating little vignettes below. 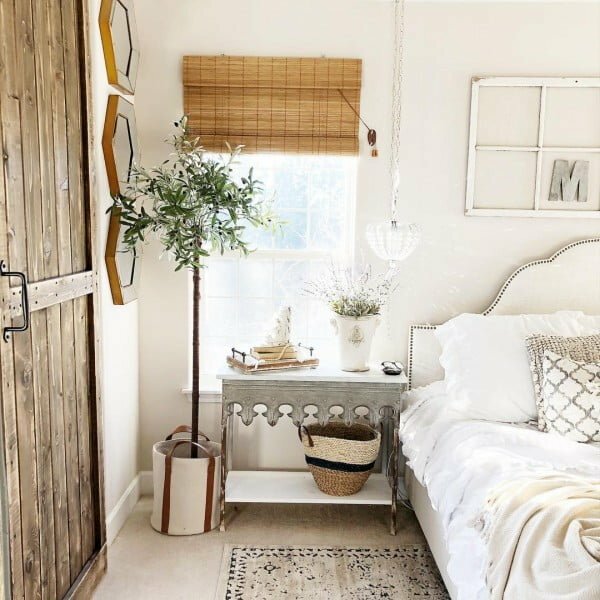 Adding a sliding barn door and hardware to a bedroom to demarcate a seating area adds oodles of farmhouse charm and is also extremely functional. 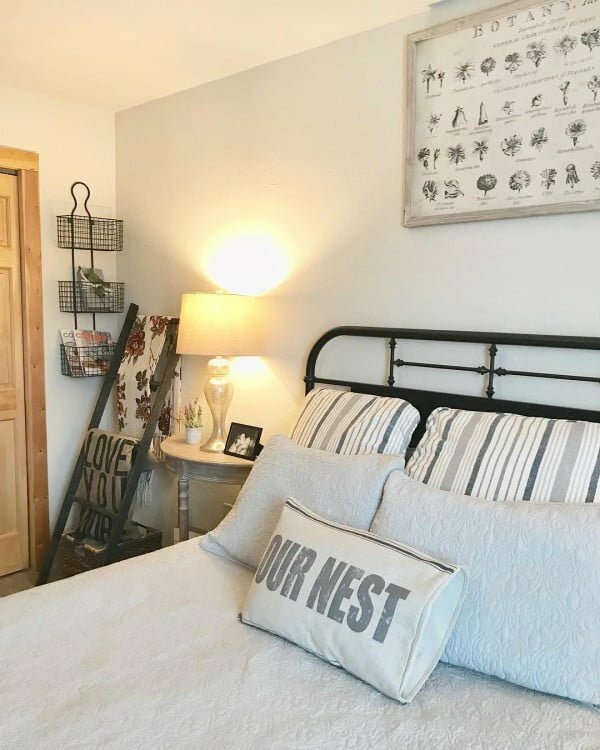 A graphic sign above the bed is the perfect alternative to the more traditional-style artwork. It adds character and a visual punch to space. 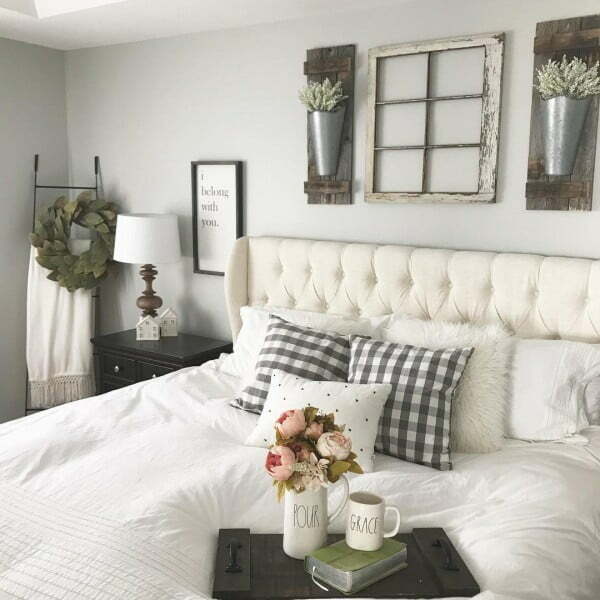 Tufted headboards have always been trendy but have found a firm toehold in the world of farmhouse decor. They add comfort and elegance. 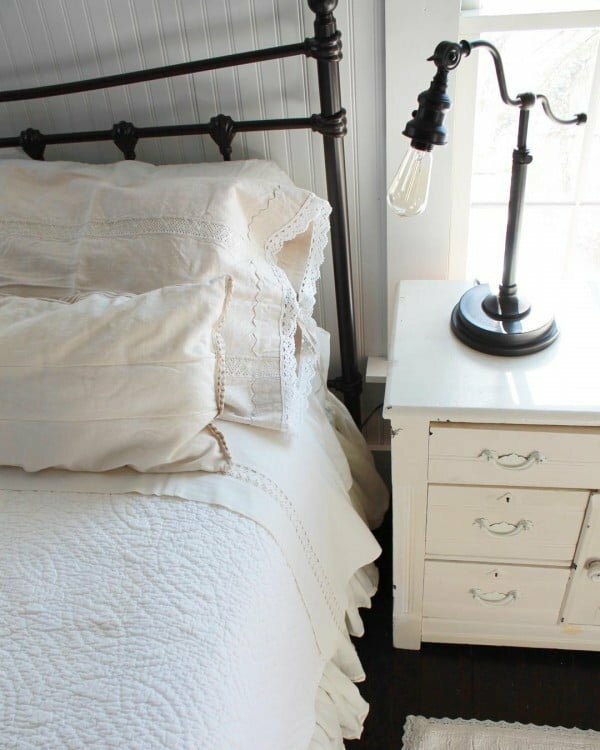 Few things channel the farmhouse spirit more so than the wrought-iron bed frame. They add a slightly industrial feel that is unique and interesting. 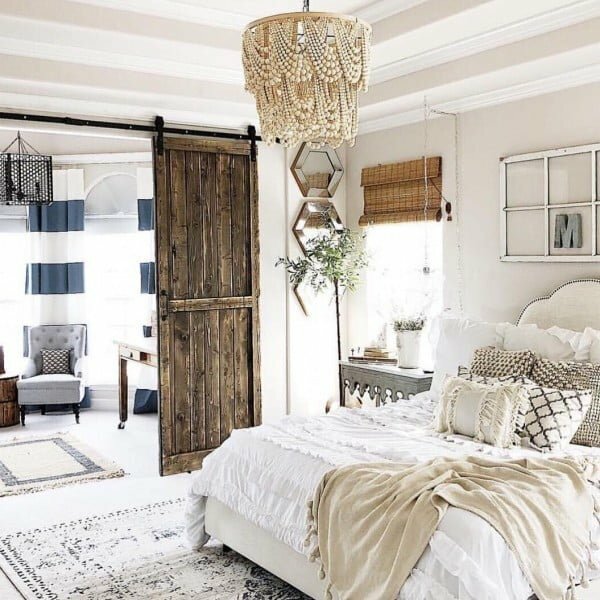 Having several shades of white in a bedroom add a clean, wholesome layered look that feels warm and inviting, while representing that perfect country home neutral color palette. 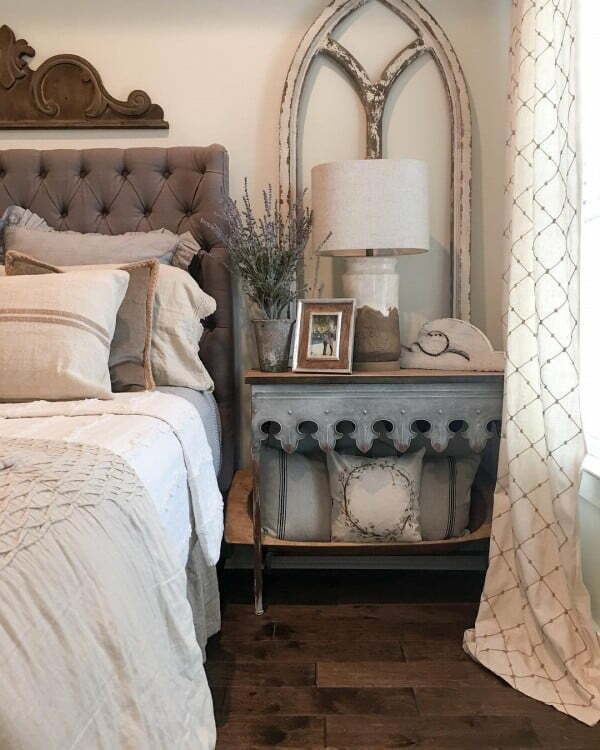 Blanket ladders are hugely popular as they add a pop of rustic charm and functionality as they display and store blankets and throws perfectly. 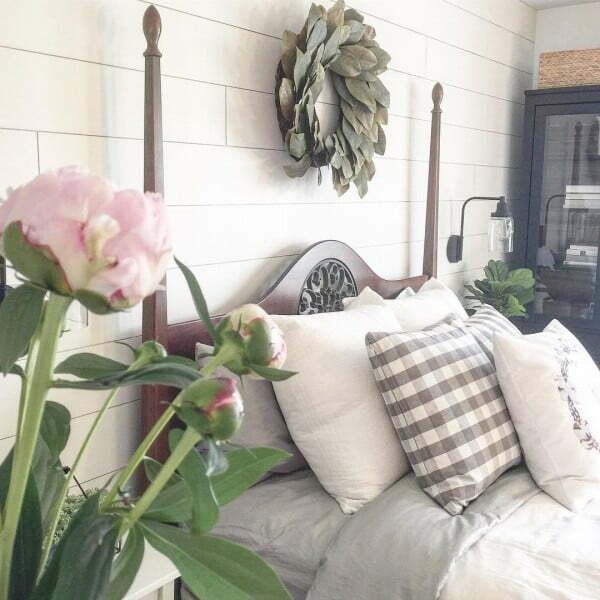 Adding shiplap to a wall adds instant architectural interest and turns walls from drab to fab in a heartbeat. Even doing a single wall in a space with shiplap has the power to transform the entire area. Having a neutral wallpaper on the wall behind the bed frames the space, forming an effective feature wall. It also helps create a mellow and relaxing vibe, so essential in bedroom decor. Having a headboard shelf is the perfect way to create a story around the main feature wall in a bedroom. Staging that shelf frames the bed space below. Having something other than the traditional framed image above a bed adds unique character to space. An old window and sign work together to create a layered and appealing look. 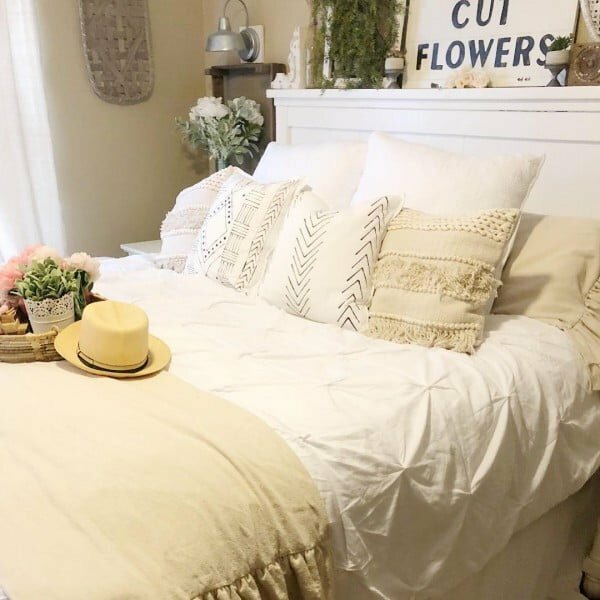 The subtle combination of creams and whites in a bedroom work together to create warmth and comfort while heralding the perfect farmhouse color pairing. 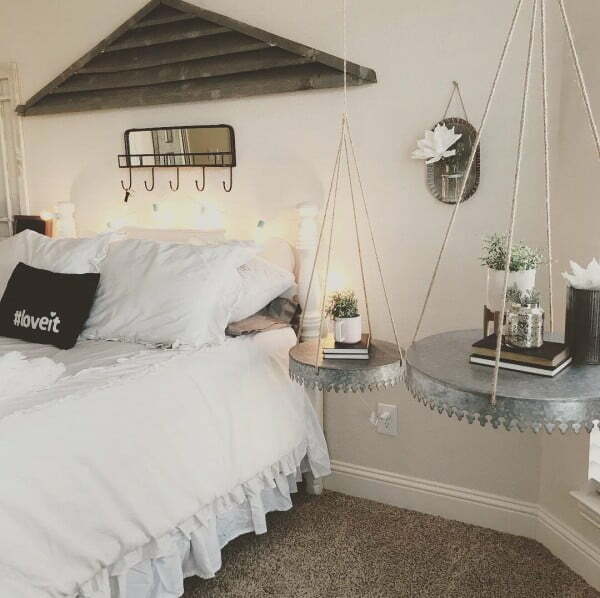 For those who yearn for originality, why not suspend your bedside tables from the ceiling and free up some floor space below. 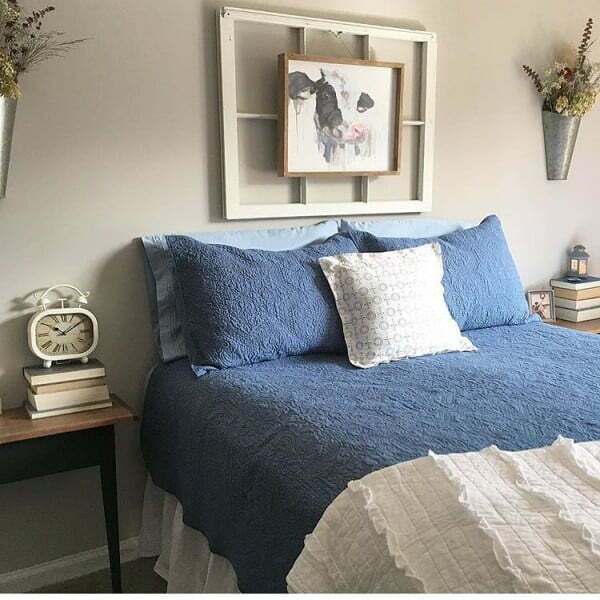 There is nothing quite like a bovine image added to space to instantly integrate the farmhouse vibe. As animals are a massive part of the farmhouse lifestyle, adding a single image is very effective. Adding greenery to an interior space appeals to the outdoor elements of the farmhouse lifestyle. Greenery warms up space, as well as improving air quality. Having a chandelier above the bed adds luxury and decadence. Pairing it with cozy farmhouse decor below elevates the space to have a multi-dimensional feel as the luxury and coziness collide. 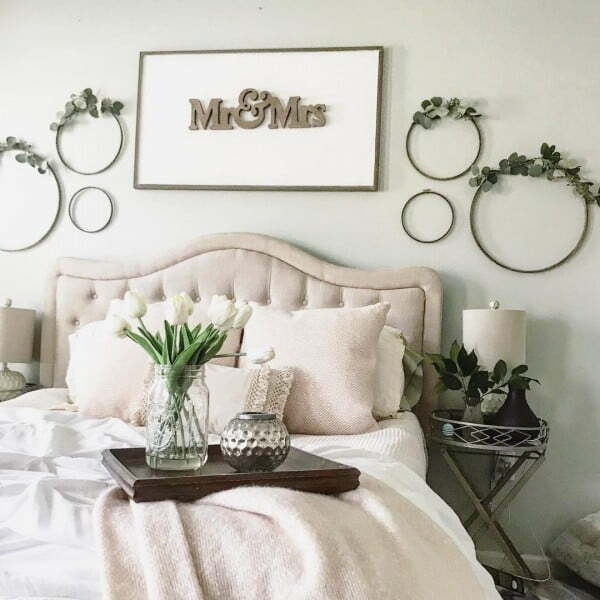 Displaying a tray with flowers, books, and a teacup on the bed beckons inhabitants to lounge around while providing a perfect stage upon which to create a comforting scene.